This Made in the USA blower based "True" low air loss mattress system is our most advanced low air loss system. It provides exceptional protection against pressure, shearing, friction and moisture. Recommended for patients with any stage pressure ulcer, myocutaneous skin flaps and skin grafts. "True" low air loss system circulates air through 16 individual cells. 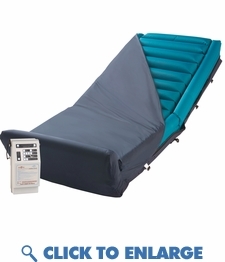 The air is distributed equally across the top mattress surface wicking moisture away from the patient-User friendly digital power unit provides rapid inflation and easy set up-Integrated side bolsters keep patients centered in the bed reducing the risk of entrapment-Features "firm" mode for dressing changes and repositioning, and "upright" mode for added support when the head of the bed is elevated-Foot pillow prevents unnecessary skin breakdown due to patient migration. The advanced pump offers additional therapies such as auto comfort, alternating pressure pulsation, and a system lock to prevent accidental adjustments. This ultra comfort medical air mattress system is commonly used in hospitals to heal up to and including stage 4 bedsores. Elite for home use. Designed to treat and heal stage 1-4 pressure sores. The alternating pressure advanced pump is ideal for pain management offering a comfortable sleep surface for patients who spend more time in bed. 5 Year warranty makes this low air mattress ideal for long term home health care Ships in 5 Business Days, Made to Order MADE IN THE USA . This Made in the USA blower based "True" low air loss mattress system is our most advanced low air loss system. It provides exceptional protection against pressure, shearing, friction and moisture. Recommended for patients with any stage pressure ulcer, myocutaneous skin flaps and skin grafts. The advanced pump offers additional therapies such as auto comfort, alternating pressure pulsation, and a system lock to prevent accidental adjustments. This ultra comfort medical air mattress system is commonly used in hospitals to heal up to and including stage 4 bedsores. Elite for home use. Designed to treat and heal stage 1-4 pressure sores. The alternating pressure advanced pump is ideal for pain management offering a comfortable sleep surface for patients who spend more time in bed.